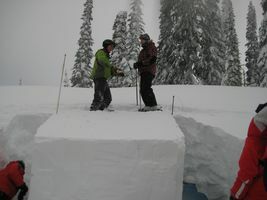 Week 2 of MTM kicked off with an Avalanche Awareness Course with Steve the Snow Scientist. 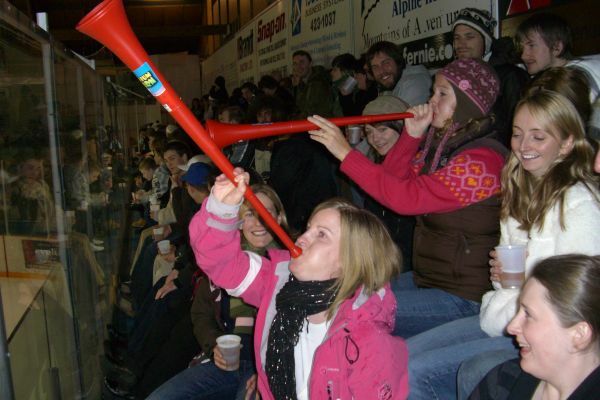 Steve had the unfortunate task of reclaiming our brains from the effects of Friday’s Ghostriders ice hockey game and the attendant beers. He impressively managed to retain our attention and imparted many gems of info about snow and how to predict avalanche risk. On Sunday, it was time to put our newly acquired skills into practice. 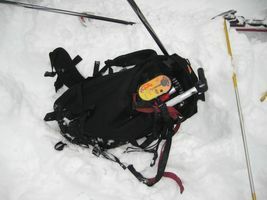 Armed with shovels, probes and transceivers, we headed for the hill to stage some rescues. 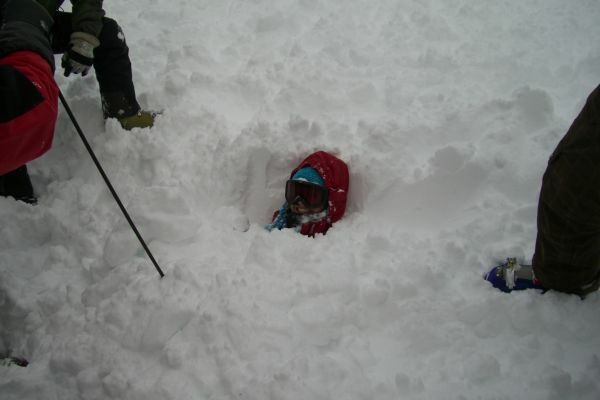 One of the skiers, Tamsin, was a very willing volunteer to be “buried” and subsequently found! 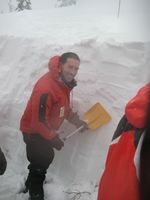 We all carried out full scale mock rescue situations, man it is hard to wade around in that snow. Some resorted to crawling or a curious “worm” style manouvre to avoid sinking quite so far! One of the guides, Eddie, announced lunch time when we were still in a bowl with deep snow sides…it took most of the allotted time just to climb out! 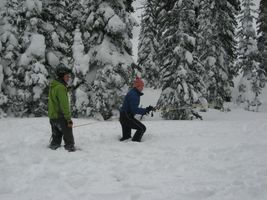 Digging test pits in the snow honed our shoveling muscles as we delved into the world of snow science for the afternoon. Alex’s punishment for lack of commitment to the dig was demonstration of the Ruschblock test! About to do the Ruschblock test – Ha! Many of us fired up our senses with a visit to the Curry Bowl restaurant on Sunday evening – yum! Monday brought sunshine and a return to lessons, with new instructors for each group. Kiwi Kirsty took on the rookies. The boys in the group suddenly seemed superkeen on improving their ski ability, and all but pushed us girls out of the way in the chair queue to impress our bonny lass from New Zealand ! 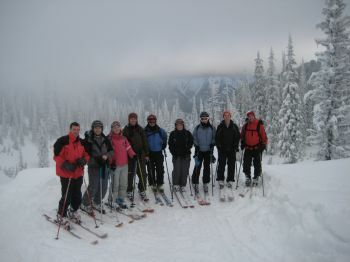 Jono’s group enjoyed some challenging runs while Terry treated his group to deep powder days. Week 2 proved to break down barriers as everyone got to know each other…what goes on a chairlift stays on a chairlift! 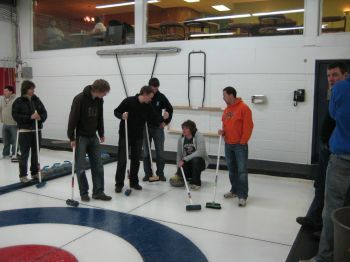 Thursday night was Curling night at the local Curling rink. The young guns whipped the old fogies but good fun was had by all. 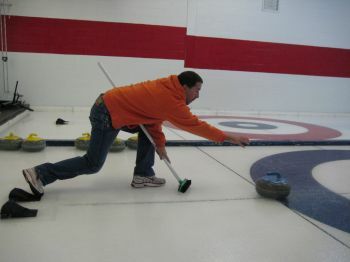 Wikipedia tells us that curling is a Scottish game and all bona fide curling stones come for one quarry somewhere in that bonny country. The aforementioned young guns were delighted to hear this week that a “gluttonous” sized portion would now be available in the Red Tree Lodge Restaurant. Sam committed some unknown misdemeanour and was put to work hosting in the restaurant…. 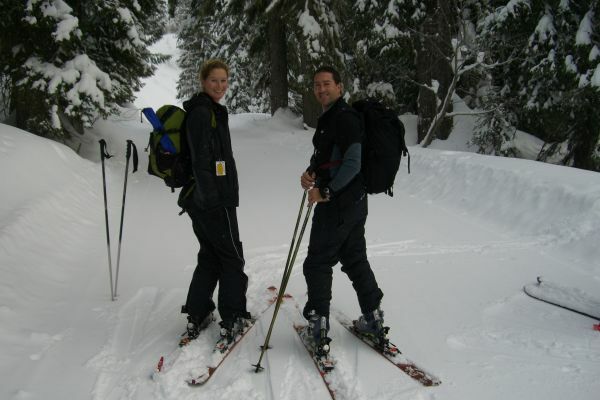 This was the week to test out ski touring gear for the first time. After a few teething problems (something to do with a techie and a million-hour-flight) all the MTMs got familiar with skins and touring bindings. 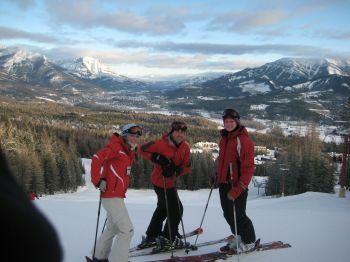 Half the group had their first full touring day on Friday with guides Tyler and Coran. Due to high avalanche risk,we were limited to where we could go. 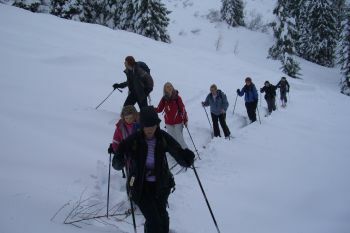 For this less experienced group, skinning uphill proved a doddle. 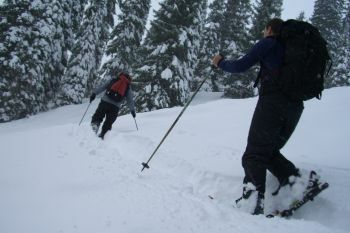 However, the guides stood agog as they watched mayhem unfold while we attempted descent of the powder slope – flies in ointment came to mind as skis, poles and limbs flailed everywhere! The afternoon took us up to Lost Boys Pass. We skinned up to the lookout, but poor visibility obliterated the view. It was beautiful up there, really quiet, and trees frosted with snow lined the slope. The descent back towards Falling Star slope took an interesting turn when I (Jane) fell foul of the “upsidedown” snow and sacrificed a ski to the mountain….an hour of all 12 of us probing and digging revealed nothing. The approaching dusk meant that Tyler had to commit an R.B.O (round buying offence) and call a skidoo to take me down. The rest of the gang skied to the safety of the Griz Bar, while I attempted a three-legged skiing effort with Tyler..unsuccessfully. I then took a ride on the skidoo with Paul “hold on tight and lean with me” the ski patrol guy. Brandied hot chocolates were called for all round to recover from the mission. Hermione our rep came to the rescue with the good old yellow bus. 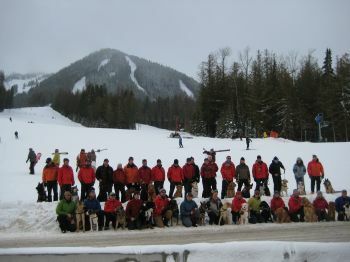 A few of the group were definitely “overserved” in the post-rescue fever. Cathal thought he would go to the pub Superman style, and entertained the guests in the restaurant with tunes on the Electric Fork. So, transport…a third bus joined the NonStop fleet this week, complete with tunes and aural Canadiana to entertain us on the way up to the Hill. Hermione has taken to wearing her helmet while driving…should we be concerned? The weekend brought a touring day for the other group, and a well earned rest for all on Sunday. Fernie was hosting an Avalanche Awareness Weekend. 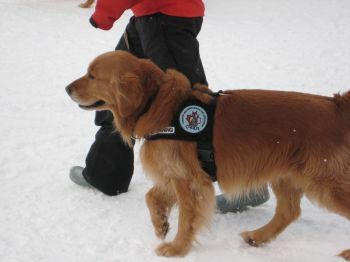 This is probably recommended for the resort – apparently ski patrollers from other resorts in the Rockies can’t quite believe how anybody runs a commercial operation here! So that wrapped up week 2 -week 3 has plenty of treats in store for us, including a trip to the Powderkeg resort for some nighttime skiing and beers! The jealousy is overwhelming as I work and drive around a rubbish and rat infested Naples. They have now commandeered the army to stop the protests as they SHIP the Neapolitan crap around the seas to Sardinia and Sicily. It’s a war zone and most of the schools in Naples haven’t opened since the New year. And Chas, did you peel the kiwi before eating her? Ah well, it wouldn’t be a message from Conor if I didn’t talk shite. I’m delighted you’re having so much fun.